Why hello pretty thang! 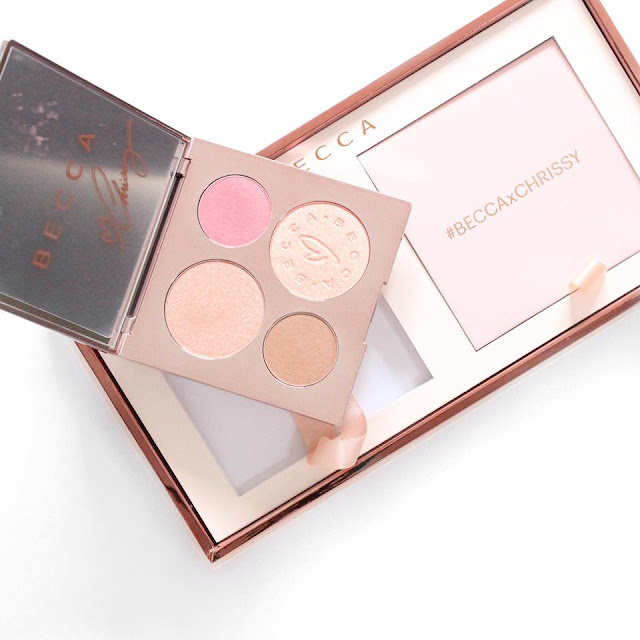 Becca have recently released a brand new face palette in collaboration with glow goddess, Chrissy Teigen. The face falette includes two highlighters, a blush and a bronzer to give you a glowy and complete base. If you want to read my thoughts on this new baby and see some swatches, keep reading! The packaging of this face palette is drop dead gorgeous. It is very reminiscent of the Becca X Jaclyn Hill palette - luxurious and heavy. With a stunning pink marble exterior with rose gold detailing, this collab is a dream to photograph. It also includes a large and very high quality mirror on the inside as well, making it perfect for travelling. Although as they say, it is what's on the inside that counts! 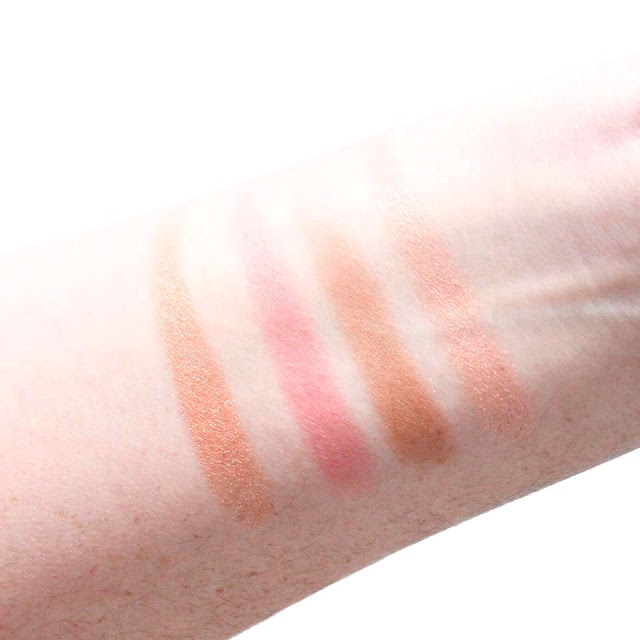 Within the palette, there are two highlighting shades, one blush and one bronzer. Suprisingly, the two highlighters are the largest in size. Whilst, I do love both the highlighting shades, I am confused that both highlighters are so big in comparison to the other shades. I feel like you would go through the blush and bronzer well before you go through both highlighters, let alone one? All the powders are incredibly smooth and buttery, definitely your typical Becca quality. If anything, the blush and bronzer feel slightly drier in texture then their regular powder products. This is a permanent in Beccas' line and is a stunning rose gold hue. This is extremely smooth and buttery. Being a paler girl, I do struggle to use this as a highlighter and instead I'm opting to add this as a blush topper or to help my bronzer look more glowy. The blush in the palette is a very universal colour that would definitely suit a lot of people. It is a warm pink coral shade with a subtle gold glitter shimmer throughout. However, these glitters don't seem to transfer to the skin when applied. I love this bronzer! I use a light hand and sweep it over my cheeks and it adds the most beautiful warm glow. It has subtle gold shimmers and these translate to a stunning satin finish on the skin. The main collaboration feature of the palette, Beach Nectar is a new highlighter offering by Becca that is a slightly peachier and lighter version of Rose Gold. Another of my favourites, this sweeped lightly on my cheekbones provides a gorgeous glow. Overall do I love the palette? Yes and no. I love the shades and the formulas of all, but with a paler skintone than Chrissy I find it a little bit harder to make look fantastic on the skin. If you were a medium or darker skintone, you would fall in love. I will still be using this regularly because I definitely still find a lot of use from the shades. Are you picking up the new Becca X Chrissy Teigen palette? Let me know below! The packaging on this is gorgeous! But, I'm not really fussed by this! Beach Nectar is so pretty, but the other shades seem pretty basic to me. I've definitely already got colours like that in my collection. I agree about the size ratio - I know I would go through the bronzer so quickly compared to the others! Agree! I don't think its extremely unique. Its very pretty and definitely a good purchase, but nothing completely shocking or different! Being pale as well I don't feel I would get much use from this either. I love Chrissy and the packaging!